"Vachss is a contemporary master." "Vachss' writing is like a dark roller coaster ride of fear, love and hate." "The best detective fiction being written ... [Vachss is] one of our most important writers." A hit man defies the confines of a life sentence to avenge his sister's batterer. An immaculately dressed man hires a street gang to extract his daughter from a Central American prison, for reasons as mysterious as they are deadly. A two-bit graffiti artist with a taste for Nazi-ganda finds himself face-to-face with three punks out to make a mark of their own—literally—with a tattoo needle. From neo-noir master Andrew Vachss comes Everybody Pays, 38 white-knuckle rides into a netherworld of pedophiles and prostitutes, stick-up kids and fall guys—where private codes of right and wrong pulsate beneath a surface system of law and order. Here is the street-grit prose that has earned Vachss comparisons to Chandler, Cain, and Hammett—and the ingenious plot twists that transform the double-cross into an expression of retribution, the dark deed into a thing of beauty. 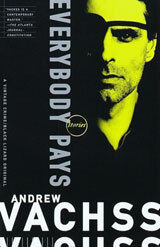 Electrifying and enigmatic, Everybody Pays is a sojourn into the nature of evil itself—a trip made all the more frightening by its proximity to our front doorstep. Amazon.com and BarnesandNoble.com, and can be found at your local independent bookstore. Read The Concrete Puppy, Dope Fiend, Dress-Up Day, Fireman, Proving It and The Real World, all of which appear in Everybody Pays. Check out the other collections of Andrew Vachss' short stories: Born Bad and Mortal Lock.